While the solar chromosphere has been routinely observed in high-resolution from ground-based optical telescopes such as the Swedish Solar Telescope (SST), and more recently in the UV from space-borne telescopes such as the Interface Region Imaging Spectrograph (IRIS), radio observations lag behind despite their great potential. 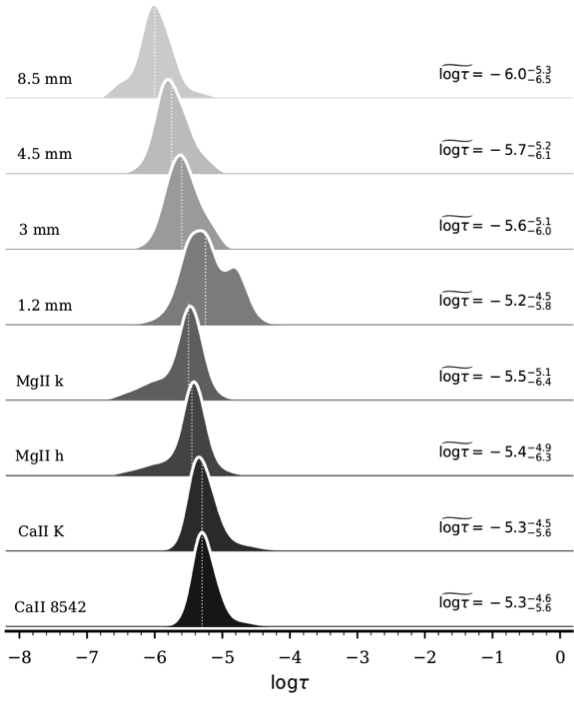 Distinctly from photospheric lines, most chromospheric diagnostics such as Ca II 854.2 nm and Mg II h and k form under non-LTE conditions, therefore they are weakly coupled to the local conditions of the plasma (e.g. de la Cruz Rodríguez et al. 2017, Leenaarts et al. 2013, Bjørgen et al. 2018). On the other hand, 1.2 mm and 3 mm continuum emission as probed by ALMA forms in the chromosphere and its source function can be treated in LTE, so it can be used to estimate chromospheric temperatures ( e.g. Wedemeyer et al 2016 ). However, proper use of ALMA data requires successful imaging at very high resolution which is a rather challenging endeavor. In fact, ALMA observations will be most useful when combined with other spectral ranges, but the combined diagnostic potential is not yet fully assessed. Figure 1 – Snapshot of gas temperature is a 3D radiation-MHD simulations of the solar atmosphere at different heights (top row) and inferred temperatures using a combination of different diagnostics. 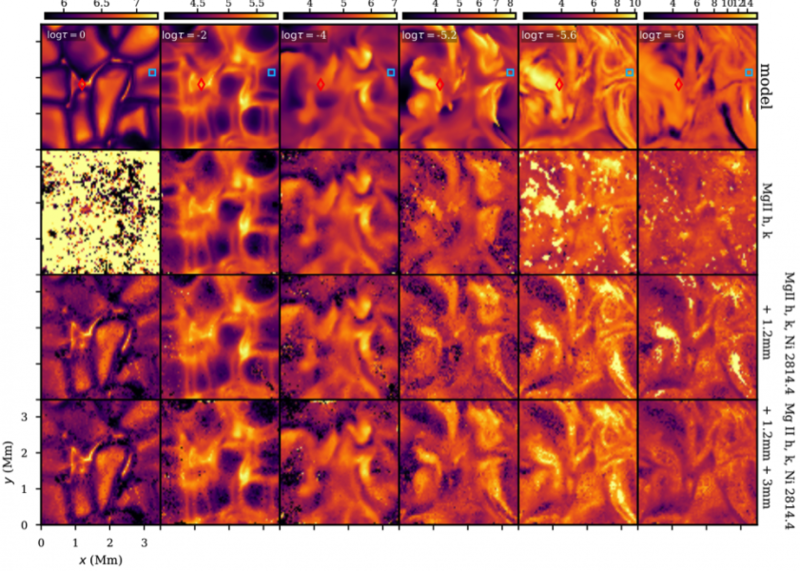 In da Silva Santos et al (2018) we we find that coordinated observations with SST, IRIS and ALMA will permit us to estimate with greater accuracy the full thermodynamical state of the plasma as a function of optical depth $\log \tau$ based on experiments with a snapshot of a three-dimensional magnetohydrodynamics (MHD) simulation of the Sun’s atmosphere. Figure 1 shows that state-of-the-art non-LTE inversion codes such as STiC ( de la Cruz Rodríguez et al 2016 ) are able to infer gas temperatures with relatively good accuracy depending on the available chromospheric diagnostics. In particular, the mm continua are expected to provide stronger constraints on the gas temperatures higher up in the atmosphere, improving the diagnostic value of the Mg II h, k and triplet lines. This is of great usefulness for the large community that makes use of IRIS observations since IRIS usually provides support for ALMA campaigns. We look forward to invert actual ALMA data to learn more about the solar chromosphere. The radio continua in the mm responds to temperature perturbations at low optical depths in the chromosphere, that is approximately the same range of heights as the cores of the Mg II and Ca II lines (Figure 2) though there might be systematic differences. By tuning into slightly different wavelength bands we can thus probe the entire chromosphere in high-resolution with the aid of interferometry (see also Loukitcheva et al. 2015). At the moment of writing only band 3 (100 GHz) and band 6 (250 GHz) are available, but the inclusion of even higher mm-bands would certainly be useful for constraining even higher layers up to the base of the transition region where we lack suitable diagnostics. Inversions with ALMA will help us obtaining more accurate gas temperatures for better quantifying heating and its location in the chromosphere, and hopefully bringing us to a closer understanding of its source. Free copy of the paper available in the author page. *Full list of auhtors: da Silva Santos, J. M., de la Cruz Rodríguez, J. & Leenaarts, J.